I was doing a new lot and thinking that maybe I'll add a greenhouse, since when winter comes the plants turn dormant. Purely out of curiosity, I placed three rows of 3 different plants inside and some trees in the other and . . . SHAZAMM!! It will have the plants even in the green house, no more waiting untill winter is over. Does the tractor work through walls? It does work if you have the greenhouse windows. This is after I planted a full garden in both greenhouses. It harvested them both. 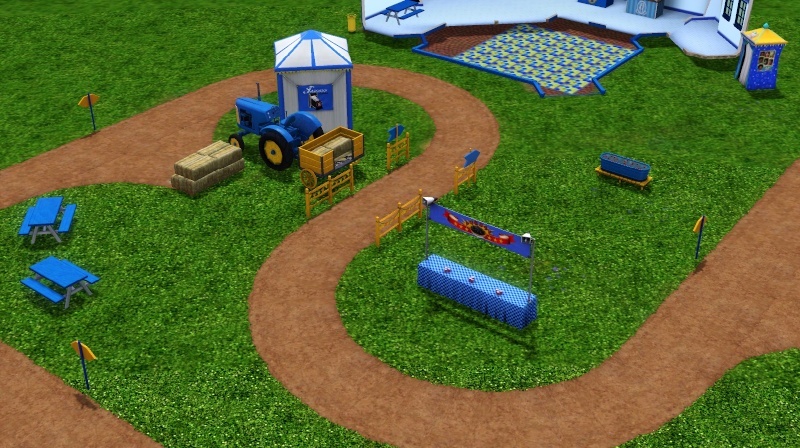 I'm trying to test out making a Festival Ground with the tractor on it. 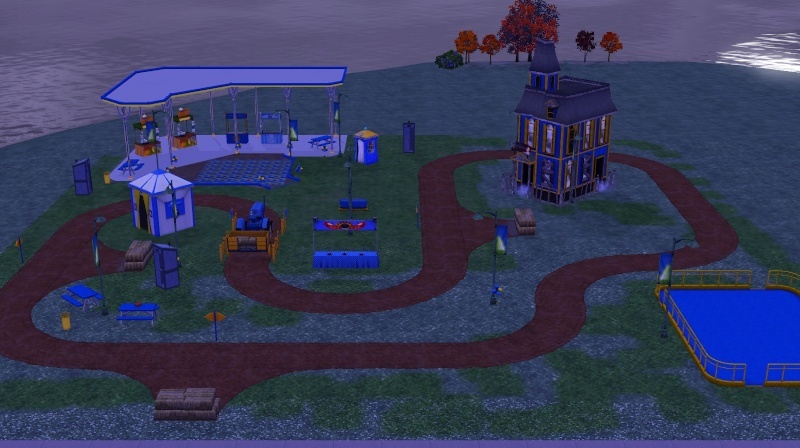 I added more track to Blue tower and leveled down the bldg. 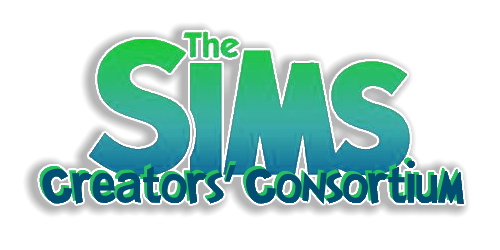 Sims did show up for the booths and Sims were able to get on for a hayride . . . But after the first turn, the tractor booted them off and popped in the grassy spot Still trying to figure out what caused it. Cool video ... Tractor Festival is a great idea! Great idea and great video. It's nice to see it in action. Well it was back to the drawing board. . . 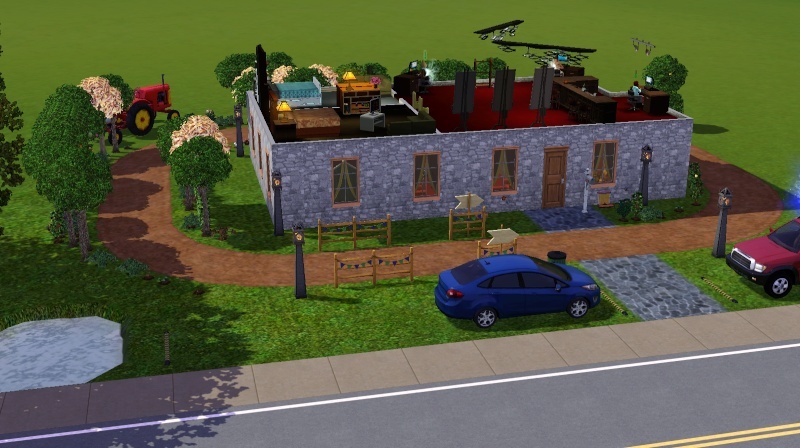 I had to completely redo the building, I couldn't figure out why the two snacks stands were disappearing when it changed seasons. I must have had MOO when I placed them. Turns out the ceiling wasn't high enough, and I made the mistake of putting it on a 60x60 instead of 50x50. Thank goodness I saved the original in my build world. So I just use the 2-story columns to build a cover over it. Now to go test it again, hope I didn't break it. What a wonderful idea! Hope you get it figured out!! Good work you're doing here. 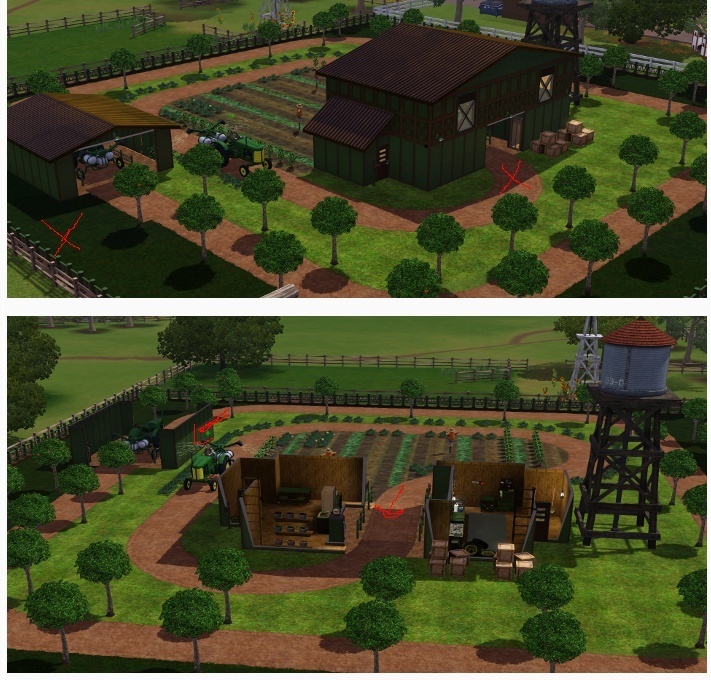 If I have a big farm with a long greenhouse and a track for the tractor going around it, the tractor will tend to the plants inside and I will be able to grow it? Then I can have a house on the right side at the front and a farm building at the back with a stable or some chicken or something? 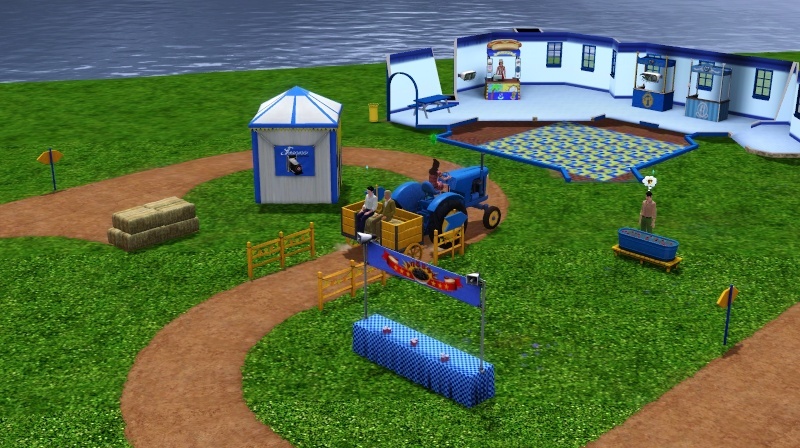 Can you drive the tractor inside the barn? It won't lift the garage door then? Just a side note, your farm is beautiful LadyGee! I love it, Appaloosa? I know, her driving through the barn doors . . of course you could alway do an open barn door. But if you want the visual effect of the doors it kinda defeats the purpose. Great ideas, ladies! I haven't had a chance to play with it yet but sure am looking forward to it. I just wake up this thread. 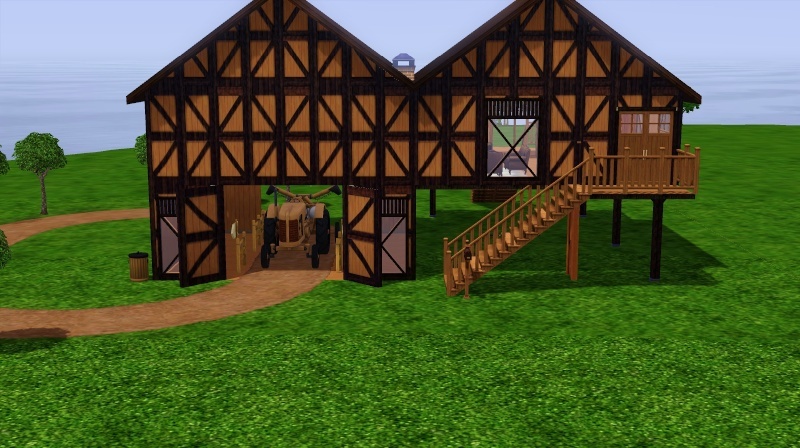 I was wondering about those barn doors for my lot, but I don't want to install Pets just for that. It does look like she harvests 5 or perhaps even 6 tiles away from the track? 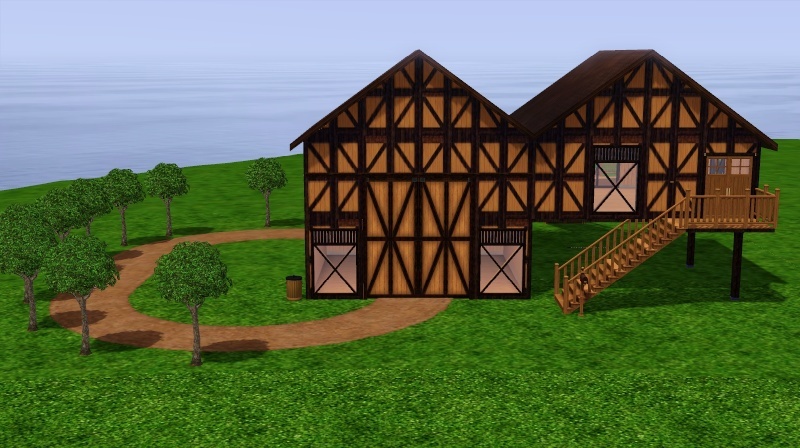 I like the open barn doors and was thinking of doing an angled wall on each side and just using the barn siding. I couldn't get the tractor to start out of the barn with the barn doors at each end. And there didn't seem to be enough room for the tractor to turn into the barn at the back. 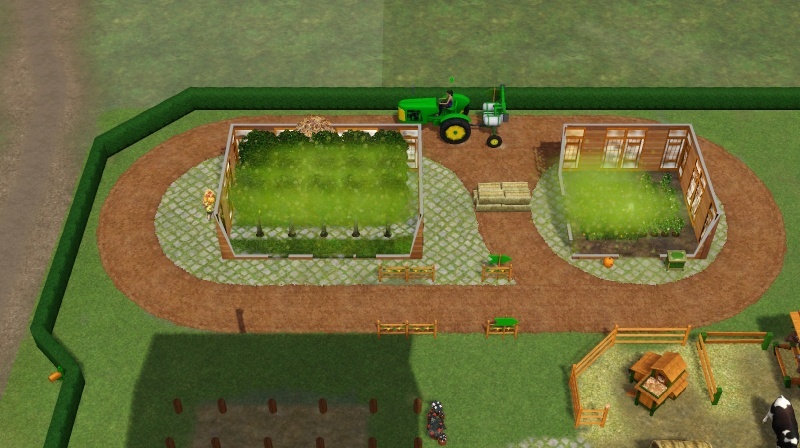 Took me so long to get the track right I got tired of the barn working for the tractor. Lionheart Farm takes the tractor 3 times to harvest to get everything. They had everything growing there for awhile. Thank you Gram, that was very useful. Perhaps I could have a diagonal wall instead. I might have a size issue, but I could perhaps just make the barn a bit smaller. That tractor is really efficient, 3 times over to harvest everything isn't that much. 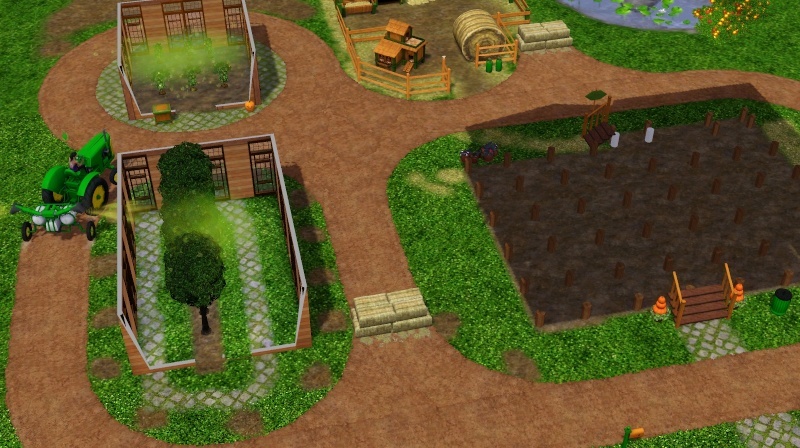 Can you get to top skills for this farming without tending to with the sim in person? Subject: Re: Tractor Discovery ! » Tractor Ride, Pig Costume, Farm Clothes & more.... Oh my!! !